Greetings fellow climbers, trekkers and service trek members. This is Dan Mazur writing to you. 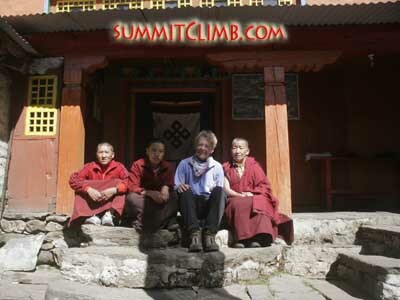 I'm one of the leaders of your Autumn programme at SummitClimb.com . I am writing to you with good news as there is a new government in Nepal, so the climbing and trekking is superb + peaceful, and Tibet is fully open for climbing and trekking expeditions. We expect the weather to be fine as September, October, and November offer some of the year's best, for our teams of men and women of all ages from around the world. I hope your August will be a good one. How is your weather and how have you been? Where I am now, its raining, windy, and cool. What kind of training are you doing to get ready for our expeditions and treks this autumn? I have been cycling, walking, and swimming. Next week I fancy a ski trip to the mountains with friends. In late June we returned from our safe and successful spring season where we had fun and made lots of new friends. Thanks to Marcia MacDonald together with the Mount Everest Foundation for a Sustainable Nepal and Tibet, we worked hard on the Deboche Nunnery, near Mount Everest and Ama-Dablam, rebuilding this rustic convent where 14 nuns from Nepal and Tibet take refuge and help preserve the Sherpa and Tibetan cultures. Marcia MacDonald and several of the Deboche nuns sitting on the steps of the convent (Marcia MacDonald). Here is the new latrine almost completed at the Deboche Nunnery (Murari Sharma). On Everest in May, our team put 14 men and women of all ages from around the world on the summit of Everest in all safety, with 14 top-flight sherpas. We had 4 people on the summit of Lhotse, the world's 4th highest mountain, with 4 sherpas, in all safety, including the first Greek and first Dutch person. Congratulations to everyone in the team (photo right: Ang Sherpa and Ms. Sophie Denis on the summit of Everest)! In April and May, our teams of men and women of all ages from around the world trekked to Everest basecamp , walked to the top of the scenic view ridge named Kala Pattar and climbed Island Peak, achieving their objectives and had a lot of fun with a great group at the same time. In July, 12 of our members and 5 sherpas reached the summit of Mustagh-Ata, the worlds easiest 7500 metre, 24,500 foot high peak, snowshoed, skied and snowboarded to the summit and back down safely (photo right by Jon Otto: Michael T. snowshoeing/racquetting around camp 2 on our recent Mustagata expedition). In the face of economic factors we have decided to maintain our focus on low prices and excellent service. We offer discounts for groups, medical professionals, and returning members. **Tell your friends about our trips and receive a 5% cash reward when they join our team! Plane tickets are still available so please obtain them quickly as seats are filling. Do ask us to send you the names of recommended travel agencies, if you are not sure. For those of you going to Nepal, we need your completed application materials and payment in the next few weeks. 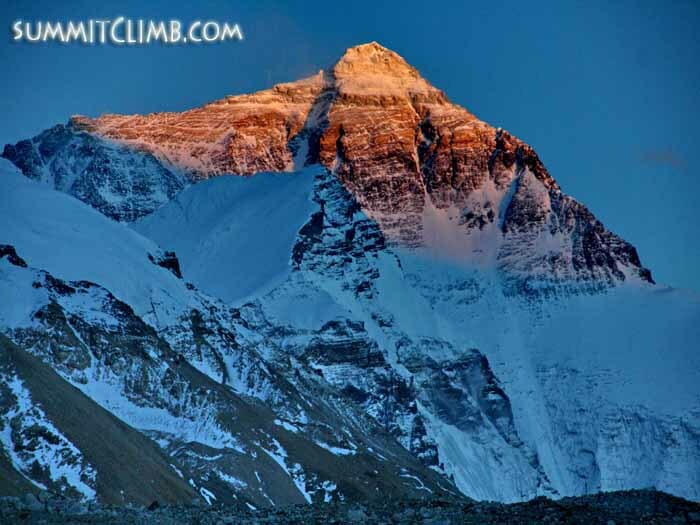 If you will join us in Tibet, for climbing Cho-Oyu, if you have not sent it already, we need your application and passport scan before tomorrow (via email) and your payment, flight details, and insurance proof shortly after. If you wish to join us on Shishapangma (we hope you will! ), we need your application materials and payment during the next week. The application is available on our website. Here's what's on this autumn, please check out our NEW ON-LINE VIDEO CLIPS ON EVERY TRIP BELOW. A 10-day Service Trek to bring medical and school supplies to a rustic farm village in the remote foothills near Everest. Working together with the Mount Everest Foundation for Nepal, Dan Mazur and a group of sherpas will be leading this trek of men and women of all ages through rolling green hills, ancient forests abounding with wildlife and terraced valleys with small family farms and rushing clear water streams. This is a low altitude trek and we have never met another tourist in this region where there are no roads, phones, electricity nor plumbing . Includes round trip internal flights in Nepal. 2-13 November. Contribution: $950, £550, €650 (photo right by Murari Sharma: Patale health post worker Jamyang and Dr. Lisa McClellan examine a Nepalese baby). Cho Oyu expedition and trek, 38 days led by Dan Mazur and Samuli Mansikka, to the very stunning and world's most accessible 8000 metre, 26,000 foot high peak and 6th highest mountain in the world, located near Everest in Tibet, from 2 September to 9 October. Our 9th Cho Oyu expedition. Some mad members want to ski/snowboard it! Full Service Cost: $8950, £4850, €6050. Optional trip to Lhasa, add $950, £550, €650. Please inquire about the cost and dates of the basecamp trek. 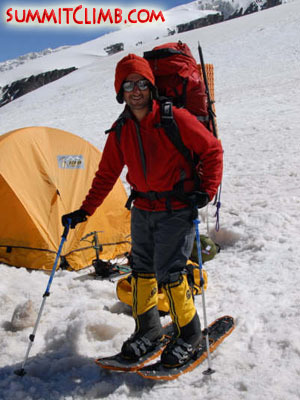 Shishapangma expedition and trek, 38 or 14 days (when combined with Cho-Oyu) led by Dan Mazur and Samuli Mansikka, to the less-visited and lowest of the world's fourteen 8000 metre, 26,000 foot high peaks, located near Everest in Tibet. Some mad members want to ski/snowboard it! From 18 September to 24 October (complete expedition) and 10-24 October (cho-oyu combination). Our 4th shisha expedition. Full Service Cost: $8950, £4850, €6050. Earn a 20% discount when combining with Cho-Oyu. Optional trip to Lhasa, add $950, £550, €650. Please inquire about the cost and dates of the basecamp trek. 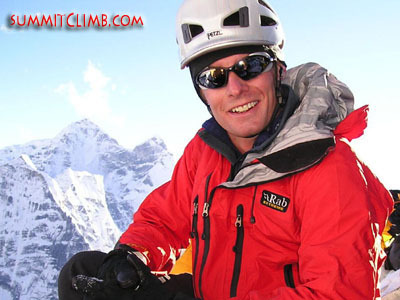 Ama Dablam expedition, one month led by Jason Thomas, to Asia's most-photographed and famous rock, ice, and snow peak, moderately-technical, but very-climbable, near Everest in Nepal, from 1 October to 1 November (additional date of 15 October to 15 November also available). Includes round trip internal flights in Nepal. 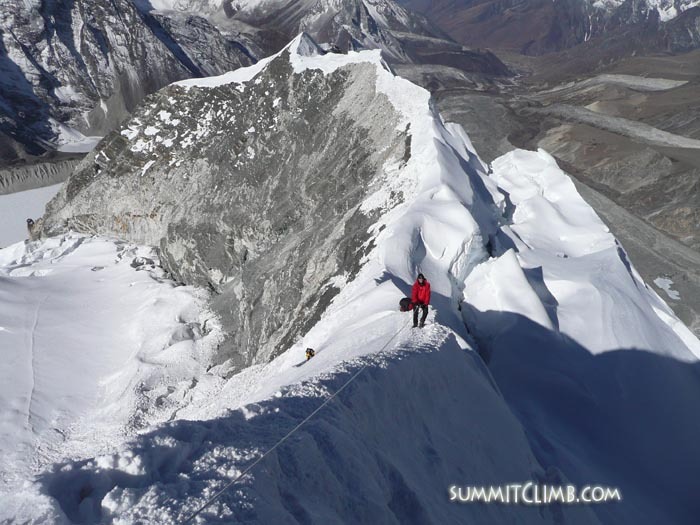 Our 10th Ama Dablam expedition. Full Service Cost: $4950, £2650, €3350. 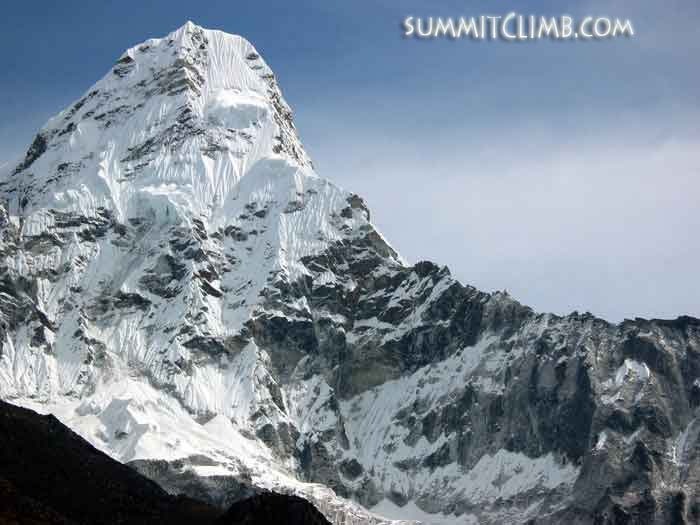 The SW Ridge route up Ama Dablam we will climb, as seen from basecamp (Chris Kinney). Team member, Bram from Amsterdam, abseiling the Grey Tower (Dan Mazur). Everest Basecamp Trek 17 days on wide snow-free trails to the world's most famous basecamp first used by Hillary and Tenzing, and walk to the top of Kala Pattar, a grassy high ridge with an amazing view of Everest and the entire valley. Led by Mingma and his lovely wife Yangjie, two of the most charming and hospitable local Sherpas you will ever meet, from 1 - 17 October. Includes round trip internal flights in Nepal. Full Service Cost: $1650, £850, €1150 (photo right by Preston Stroud: Our trekking team near Everest base camp). Island Peak (trekking peak) 5 days on the most famous trekking peak near Everest, easy 6000 metre, 20,000 feet high, involves a day of climbing on snow, and we teach you everything you need to know about snow climbing and our top team of Everest sherpas will be there to guide you every step of the way, from 18-22 October. Full Service Cost: $850, £450, €550. 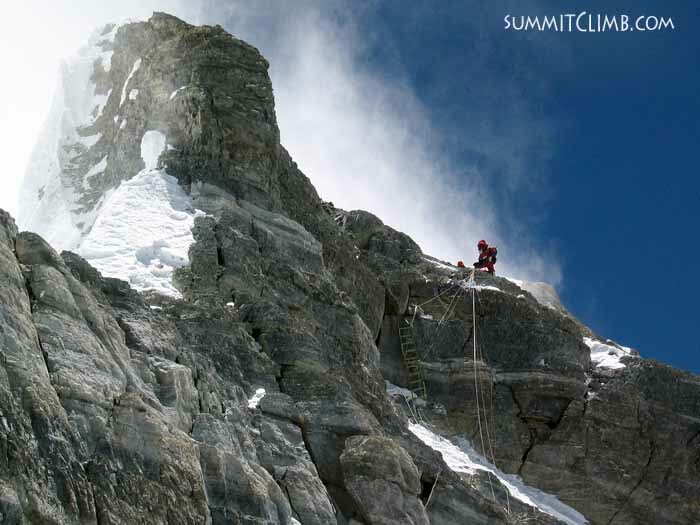 Our team ascending the summit ridge on Island Peak (Emil Friis). Our team member on the shoulder to the summit (Stefano Ricci). NEW Everest-view Glacier-school. In just one week, learn detailed glacier travel skills and put those skills to work right away climbing the famous easy trekking peak Lobuche East, 6000 metre, 20,000 feet high, located near Everest. Our school is led by the famous Raj Thapa, a top climber and a British Mountain Leader and Climbing Instructor, from 1-22 October (includes round trip internal flights in Nepal), or 10-16 October (seven day option). Full Service Cost: $2450, £1350, €1650. Seven day option: $950, £550, €650. A great view across the Cho La Glacier where we conduct our training lessons (Valerie Hovland). 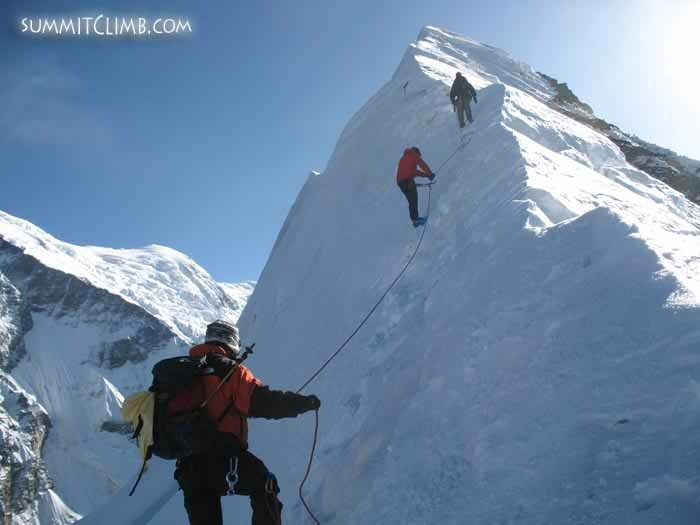 Team members on the summit of fun trekking peak Lobuche East on a perfect sunny day (Valerie Hovland). 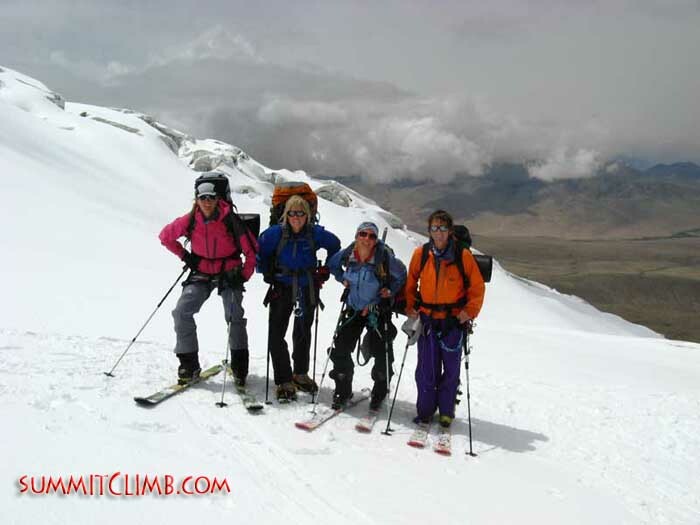 Aconcagua Climb, 20 days of great introduction to 7000 metre, 23,000 foot high peak climbing. 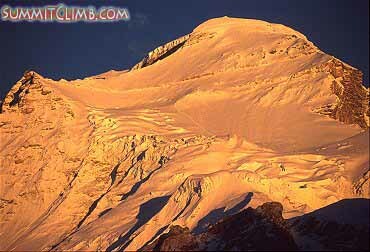 The highest summit in all the Americas. Our 6th Aconcagua climb. Our trip is led by a staff of Mountain Professionals. From 5 to 24 January and 1 to 20 February, 2009. Full Service Cost: $3250, £1750, €2150. We have now confirmed the dates, so its time to join the team (photo right by Dan Mazur: Aconcagua as seen from basecamp)! 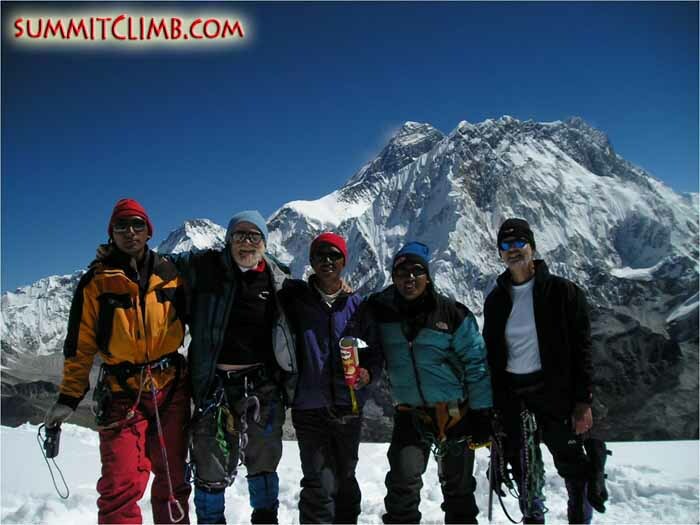 Everest Nepal Climb, 68 days on the classic route first climbed by Hillary and Tenzing in beautiful Nepal, from 29 March to 5 June, 2009. Includes round trip internal flights in Nepal. Our 7th Nepal-Everest expedition. Full Service Cost: $24,350, £13,150, €16,450. Everest Tibet Climb , 68 days on the less-traveled route made famous by Mallory and Irvine, through Medieval Tibet, from 29 March to 5 June, 2009. Our 8th Tibet-Everest expedition. Full Service Cost: $19950, £10,750, €13,450. Optional trip to Lhasa, add $950, £550, €650. 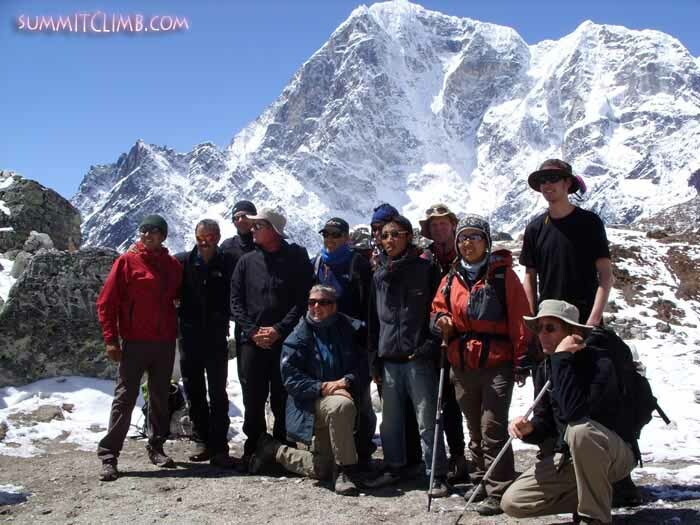 Cho Oyu Climb and Trek, 38 days on the world's most accessible 8000 metre peak, from 23 April to 30 May or 1 September to 8 October, 2009. Our 10th Cho Oyu expedition. Full Service Cost: $8950, £4850, €6050. Optional trip to Lhasa, add $950, £550, €650. Please inquire about the cost and dates of the basecamp trek. Lhakpa-ri, North-col, 28 days experiencing an easy walk-climb to 7000 metres, 23,000 feet in medieval Tibet, on the shoulder of Mount Everest. A fun high-altitude test, and if you do well on the earlier trip, its possible to progress directly to Cho Oyu or even Everest during the same climbing season! From 1-28 March, 29 March to 25 April, and 30 April to 27 May, 2009. Full Service Cost: $5950, £3250, €4050. Optional trip to Lhasa, add $950, £550, €650. 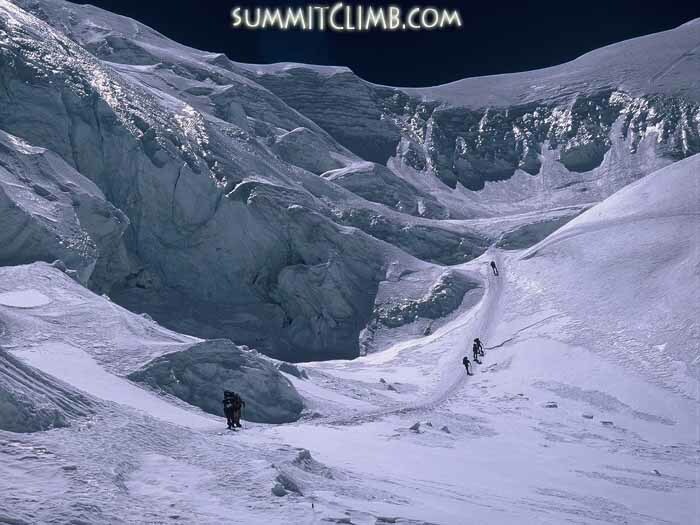 Climbers approaching the North Col at 6,800 metres/22,300 feet (Ryan Waters). 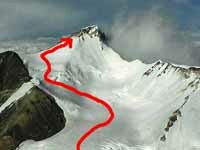 A good view of the route up Lhakpa Ri (www.lhakpari.nepal-online.de). 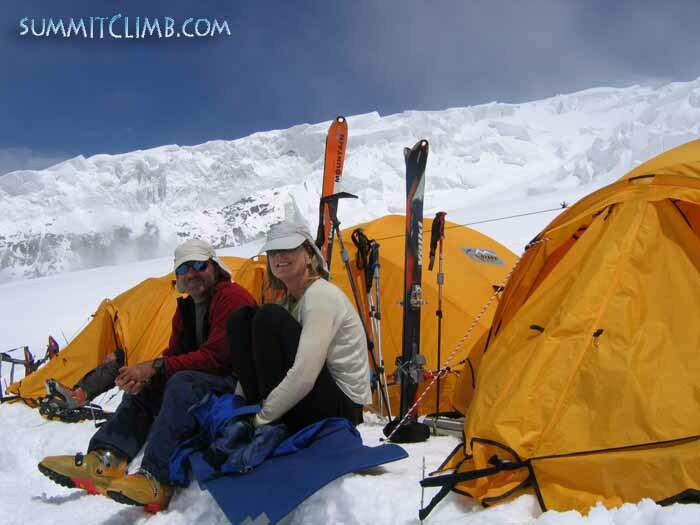 EBC Trek Nepal, 18 days trekking on wide snow-free trails to the world's most famous basecamp first used by Hillary and Tenzing, and walk to the top of the grassy ridge at beautiful viewpoint Kala Pattar, from 29 March to 15 April, 1 to 18 May, or 1 to 18 October, 2009. Includes round trip internal flights in Nepal. Full Service Cost: $1650, £850, €1150. 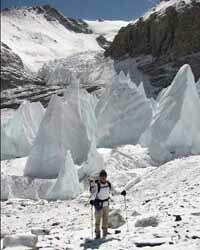 ABC Trek Tibet, in only 20 days, explore exotic medieval Tibet and walk on wide snow-free trails all of the way to what must be the world's highest basecamp, made famous by Mallory and Irvine, at 6400 metres, 21,000 feet, from 29 March to 17 April or 30 April to 19 May, 2009. Full-Service Cost: $2450, £1350, €1650. Optional trip to Lhasa, add $950, £550, €650 (photo right by Michael Hsu: Michael Hsu trekking close to ABC. Behind him are the huge "ice pilgrims" that are littered across the Rongbuk Glacier. They are quite fun to walk through and explore, as they are always changing. The geography of the area is stunning and it almost feels like you are on a different planet at times. A small 5mm/1/4 inch dusting of snow had fallen overnight when this photo was taken). 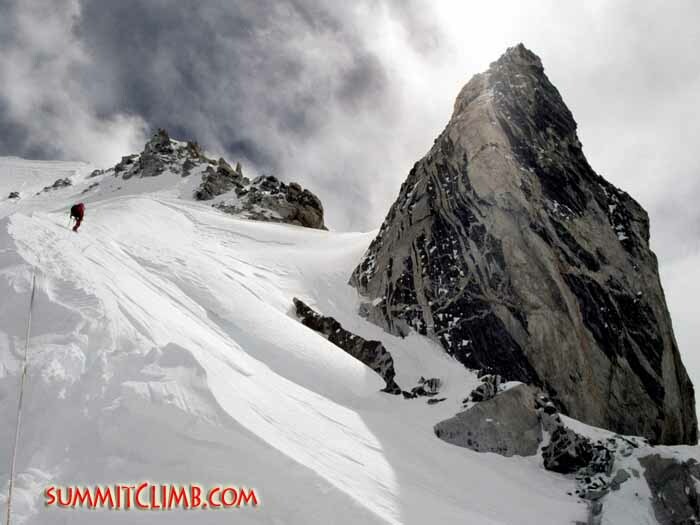 Island Peak Climb, in just 5 days, an excellent introduction to 6000 metre, 20,000 foot high peak climbing, from 15-19 April, 18-22 May, and 18-22 October, 2009. Full Service Cost: $850, £450, €550. NEW Everest-view Glacier-school. In just one week, learn detailed glacier travel skills and put those skills to work right away climbing the famous easy trekking peak Lobuche East, 6000 metre, 20,000 feet high, located near Everest. From 29 March-19 April, 1-22 May, and 1-22 October, 2009. Includes round trip internal flights in Nepal. Full Service Cost: $2450, £1350, €1650. Seven day option: $950, £550, €650. A 10-day Service Trek to bring medical and school supplies to a rustic farm village in the remote foothills near Everest. Working together with the Mount Everest Foundation for Nepal, Dan Mazur and a group of sherpas will be leading this trek of men and women of all ages through rolling green hills, ancient forests abounding with wildlife and terraced valleys with small family farms and rushing clear water streams. This is a low-altitude trek and we have never met another tourist in this region where there are no roads, phones, electricity nor plumbing. Includes round trip internal flights in Nepal. 6-17 June, 2009. Contribution: $950, £550, €650. 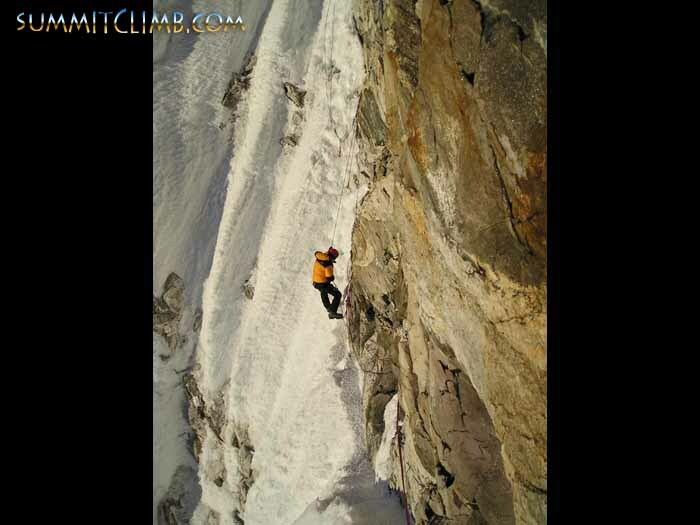 Mustagata, in only 24 days, the worlds easiest 7500 metre, 24,500 foot high peak. Snowshoe, ski and snowboard to the summit and back down safely. 24 days in China, from 1-24 July 2009. Our 11th Mustagata climb. Full Service Cost: $4250, £2250, €2850. We welcome you to join our team for Autumn 2009 Trips, same as above. PPS. Cant go this season? 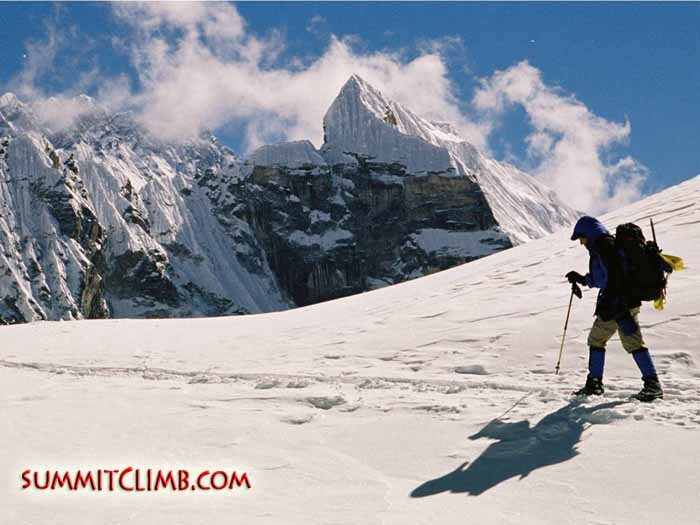 We offer our trips each year so please come back and climb and trek with us at another time, whenever you are ready. PS. Would you like to become a climb or trek leader? We welcome men and women of all ages from around the world. Please take a look at our Leader-In-Training programme. PPS. Last but certainly not least, this email is dedicated to Sean Foxcroft, an exemplary Leader-In-Training. PPPS. We still have quite a few of our Himalayan colour postcards left, so if you would like to receive one in the post, please email us your postal address. Thanks! Telephone: (+44) (0) 7810 375400 (evenings, Monday - Friday). Congratulations, you made it to the bottom of this email. 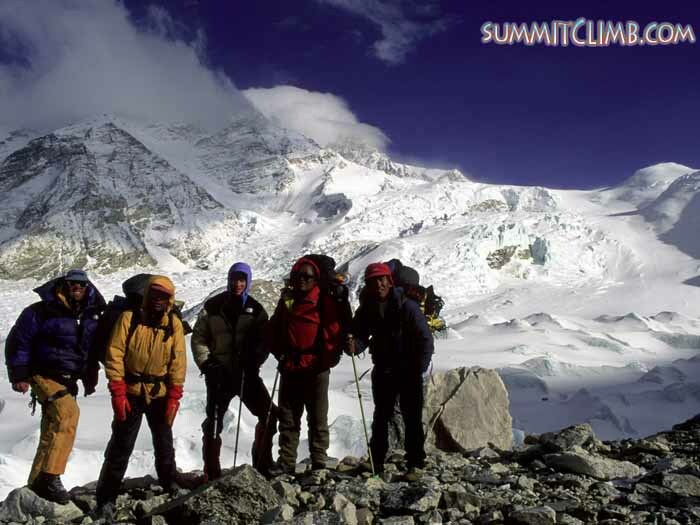 You must have what it takes to become a member of an Himalayan expedition, patience and perseverance!